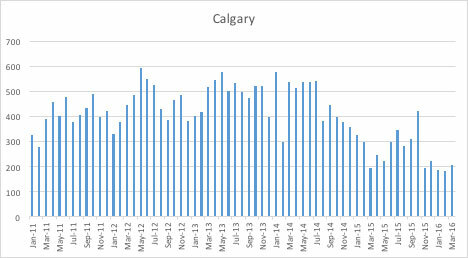 In the month of March 2016 The City of Calgary issued 206 building permits for the new / greenfield construction of homes. This is a far cry from the heady days of a couple years ago, when an average of 450 permits / new homes were going up each month, but it does perhaps signal the end of the economic slide in this city. Here’s why: for a year there have been month over month drops in the number of permits being issued – that is until January when the curve bottomed-out at 186 permits. February saw 183 permits, and now March has 206. Certainly some of this is a result of seasonal variation, however a steady rate of 180 to 200 permits / new homes per month may be a strong indicator that we have reached the bottom, and can begin to adjust to the new norm, or, dare I say it, begin to hope for some distant and undetermined level of a new recovery. This is good news, and should be welcomed after months of dreary energy sapping daily pronouncements of economic doom. Everyone at Framework Partners is eager to remind me, and you the reader, that three data points do not make a trend, and that January to March is typically a period where new permits are taken out as the spring construction period ramps up. However, it is also fair to say, as is evidenced by the chart above that we may have reached the bottom and can now plan for a more certain future. Hence, the question becomes: how many months of stable economic development in the new home sector do we need to see before we can have confidence that the recovery has not started, but at least the slide has stopped? Of course the answer, in this city, is that it depends on the price of oil. 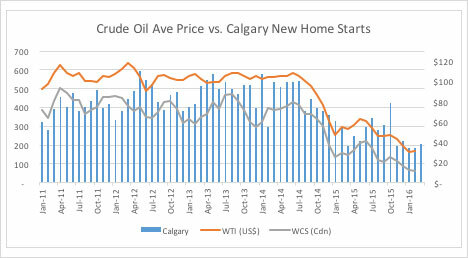 When we take the same data as above, and over lay the average Crude Oil Monthly Price (WTI / US $ per Barrel) we see that housing starts in this city move in lock step with the price of oil. (please see the chart below). Framework Partners is a Calgary based research and strategy house. We produce research and analytics for clients across Canada and into the US. For more information on how insightful and meaningful information can inform decisions at your organization please contact Alec Milne at 403-261-7077. For more on developing research-grounded strategies please contact Alec Milne at 403-261-7077. Member-Based Organizations Is Your Board Adding Value?